Series of arches with their supporting columns, piers or pipes called arcade. The arches are constructed mainly for architect effect but for some times for economy in cost in case of small span. The arches transmitting loads from above to the sides of an opening. In past when RCC roof are not in use, brick arch roofing used to be popular and economical mode of roofing for building. 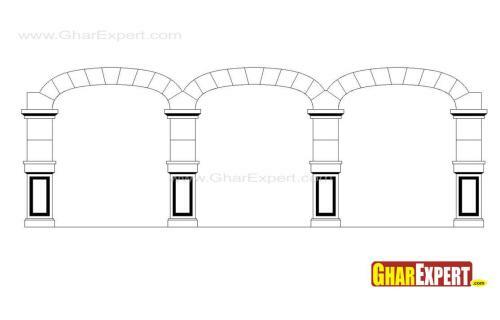 Arch work shall include masonry for both gauged as well as plain arches. In gauged arches, cut or molded bricks shall be used. In plain arches, uncut bricks shall be used. 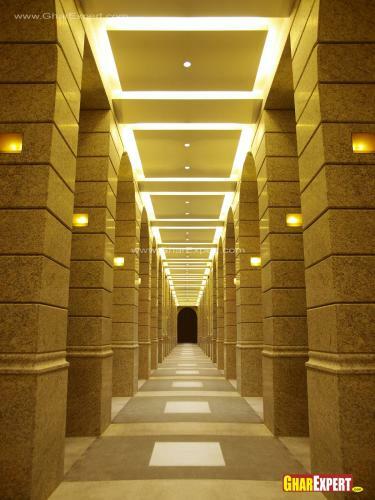 The Arch is built with uncut bricks having wedge-shaped joints between bricks. Such an arch is said to be rough because the wedge-shaped joints look ugly and the finished effect of arch is rough. Rough arches are not normally adopted for facing brickwork. The minimum thickness of joints should be 5mm and maximum 15 mm. In gauged arch construction, cut bricks or molded bricks are used. Any good facing brick can be cut to a wedge shape on the building site. The gauged bricks have been accurately prepared to a wedge shape such that they can be put together to form an arch with very thin joints between them. The finished effect of accurately gauged red bricks with thin white joints between them is very attractive. What is arch? This article contains the defination of the architectural terms 'Arch' & information on diiferent types of arch. Various clerestory design and pictures available in this write up. Anchor bolt are made of Milled steel and used to attach concrete to structure. Ducts or Air ducts are used in air conditioning, heating, ventilation to remove or deliver air. What is clerestory roof? This article describe all the facts about clerestory roof.